Mr Pochez from Vintage Luxury Bicycles in Spain recently displayed his beloved early 1980's Ciocc San Cristobal bicycle that is fitted with a very special Campagnolo Groupo from 1983. This superb example of a Ciocc San Cristobal steel frame has been dipped in 24 karat gold paint. Campy Super Record parts commemorating the 50th anniversary of Campagnolo have been fitted. The build was then finished with a Cinelli special edition saddle, saddle bag, stem, and handlebars. 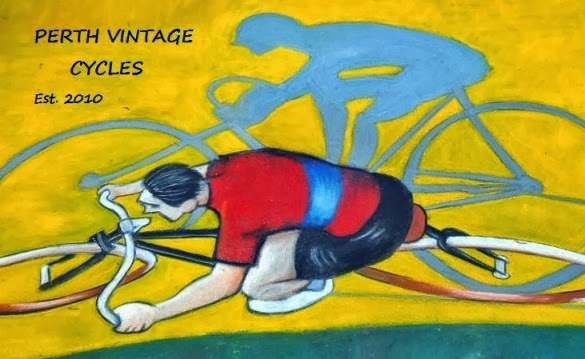 It's a very unique piece of Italian cycling culture that would be a treasured possession for any vintage cycling enthusiast. 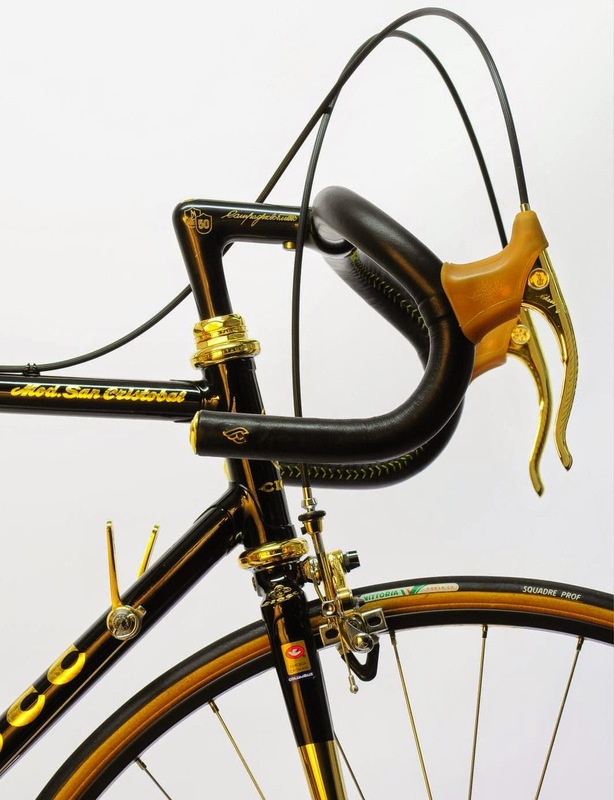 The group set used for this build was released in 1983 to commemorate Campagnolo's 50th year in business (1933 - 1983). Coincidentally, this was also the year that Campagnolo's founder, Tullio Campagnolo, passed away at the age of 82 years. About 15,000 sets were made. Group set #00001 was retained by the Campagnolo museum and set #00002 was presented to Pope John Paul II. 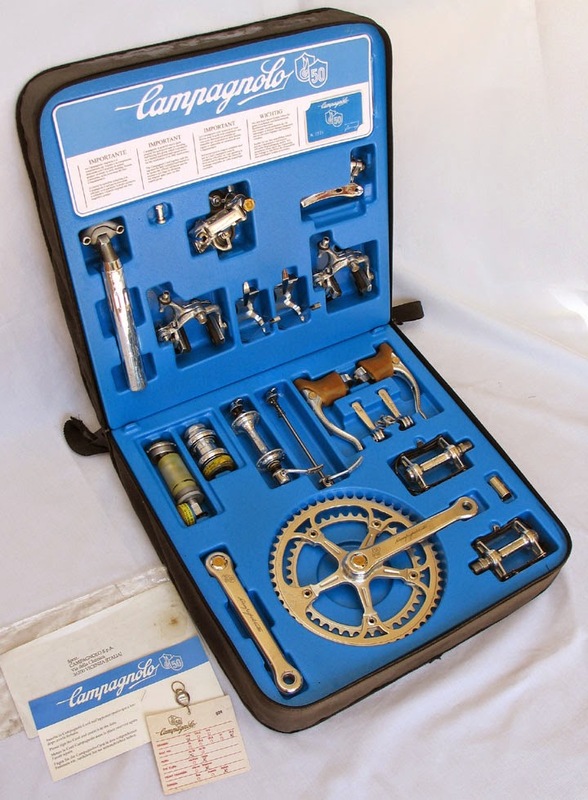 All sets were presented in a commemorative black case and were issued with a numbered Campagnolo membership card. The group set was based on the Super Record set which sits at the top of the Campagnolo series. 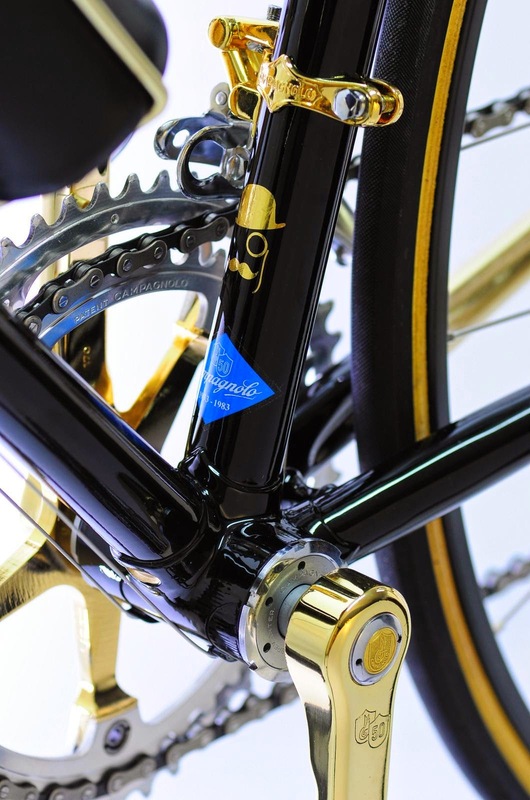 Each piece has significant touches such as the gold Campy shield and an engraved signature of Tullio Campagnolo. Most pieces also carry an etching of the Campy 50th logo as below. The proud owner of this set has taken the next step by plating each piece in 24 karat gold. 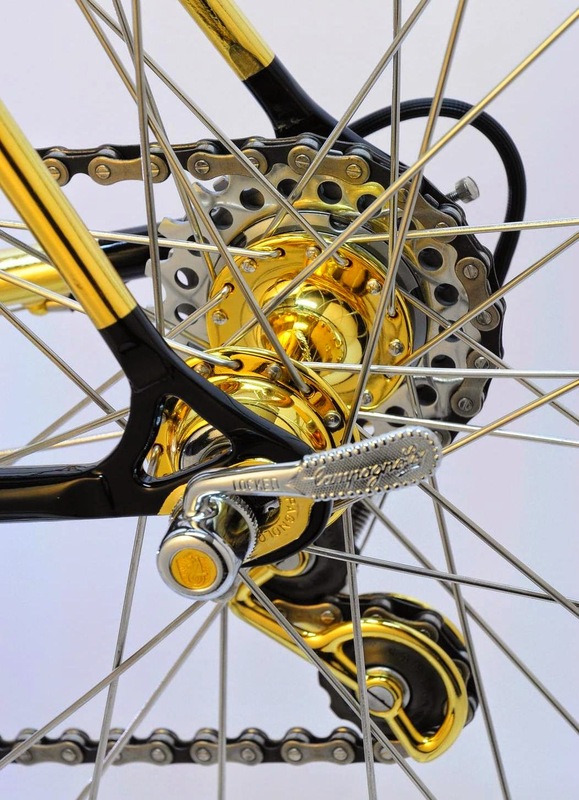 The Ciocc frame has also been treated with gold karat plating. A special edition Cinelli Unicanitor saddle was also produced to compliment this series......and what a beautiful saddle it is. Cinelli Unicanitor special edition saddle. Ciocc, Campagnolo, and Cinelli, a fantastic trifecta of Italian cycling history.